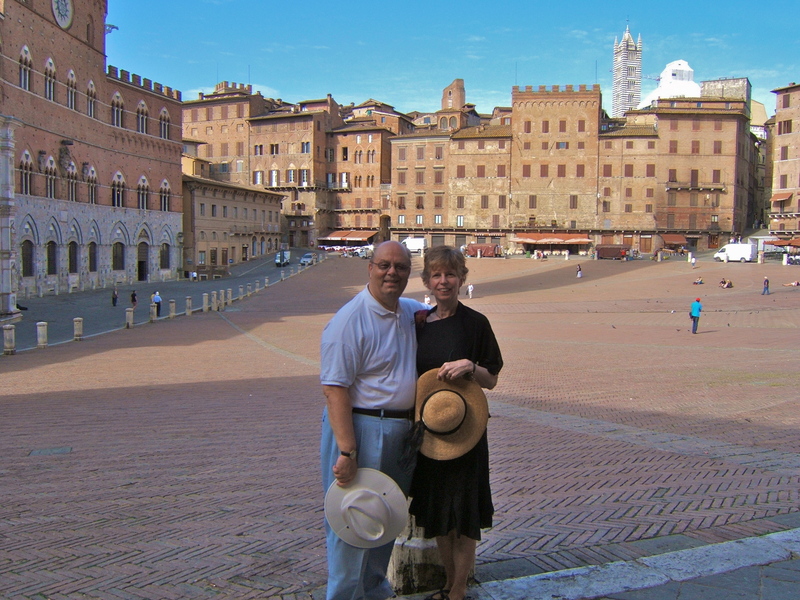 Compiled a montage of pictures and video clips from our trip to Italy in July 2008. Brief interlude in the video with some cat photos, as we are recent owners of two kitties. Music provided by the Silvertones, a choral group at Strath Haven High School in 1997. The Silvertones toured Italy in 1997 and made a CD of their concerts; our daughter was a member. Also featured is the chorus from Umbrian Serenades, the chorale group Richard sang with while in Italy. Richard’s solo, which he performed at St. Francis of Assisi Cathedral, begins about half way through the video. This was our first trip where we brought along a computer for journaling, emailing and Skyping. I still kept a scrapbook and wrote by hand, but most of my writing was word processed or sent in emails. On past trips I had to rely on visits to Internet cafes to email home. We also used the computer to send photographs. Hello!! We’ve Skyped John already and works great! We were positively miserable on the airplane. Oh, dear, maybe we’re just getting old. The flight was perfectly smooth, too. The people in back of us requested that we not put the seat back (as little as that goes). We could not sleep for a minute! Both of us were woozy and could hardly cope with the sleeplessness of it all. 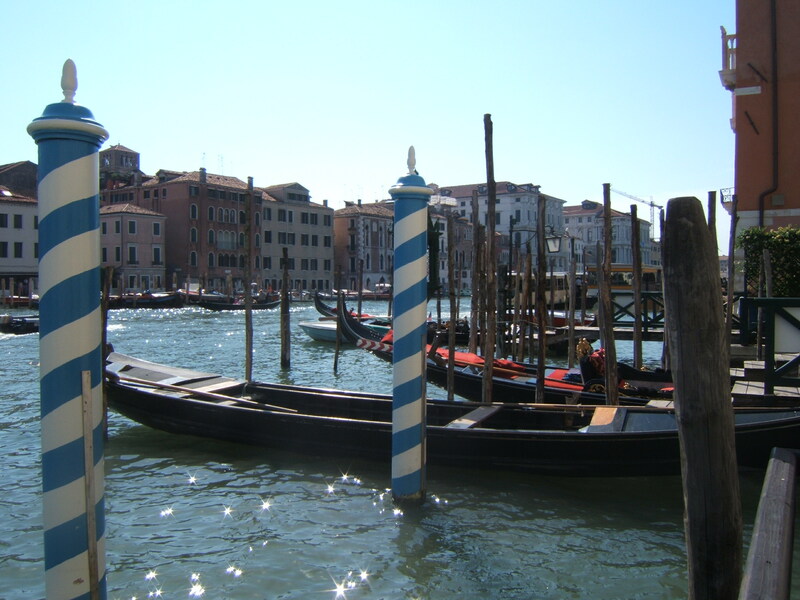 When we arrived at Venice, we had to wait at the pier, which rocked back and forth as the water was very choppy. The ride over to the island took the better part of an hour, and we had to transfer to another waterbus before reaching the hotel. We were utterly exhausted and fell into bed! That’s the unfortunate part. Our hotel, the Foscari Palace, was exactly that, a palace. The rooms were very comfortable with lots of little amenities including free Internet. Most welcome was a variety of fresh fruit displayed in a silver bowl. 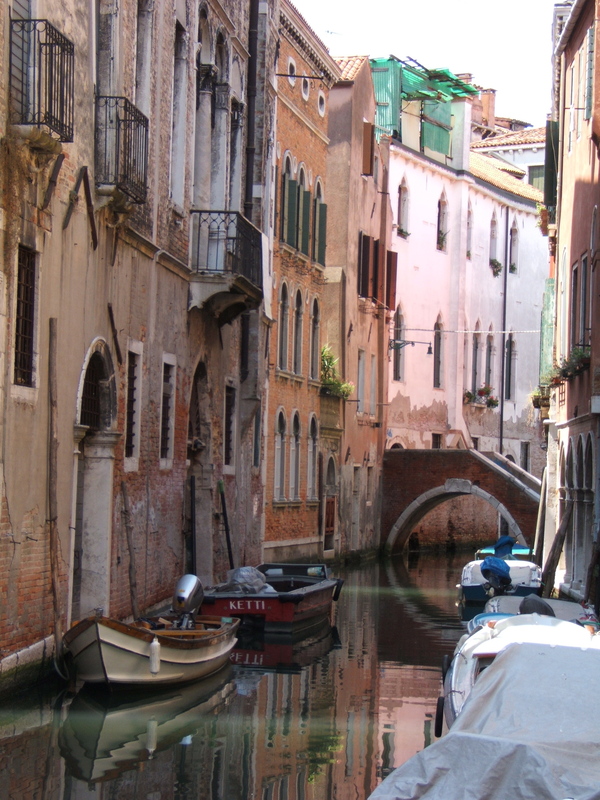 Yes, and Venice is fantastic; every vista is a photographic opportunity with the architecture, flowers, ironwork and, of course, the well-placed gondola of which there are hundreds. 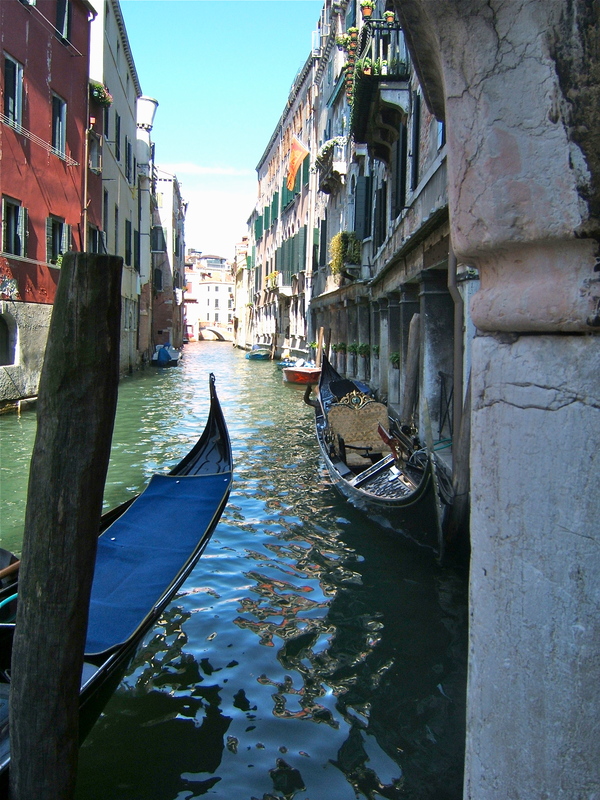 The gondolas are quite beautiful, decorated with elaborate seating and comfy pillows. Venice is larger than I had imagined. I had not anticipated the level of boat activity needed to support the city. Freight and construction boat traffic adds to the mix of water taxis and buses. Walking through maze of side streets felt like we could easily get lost, but every narrow pathway held another surprise. The shop windows were artfully decorated. We especially liked the many bookstores and map shops and had to take photos of their displays. 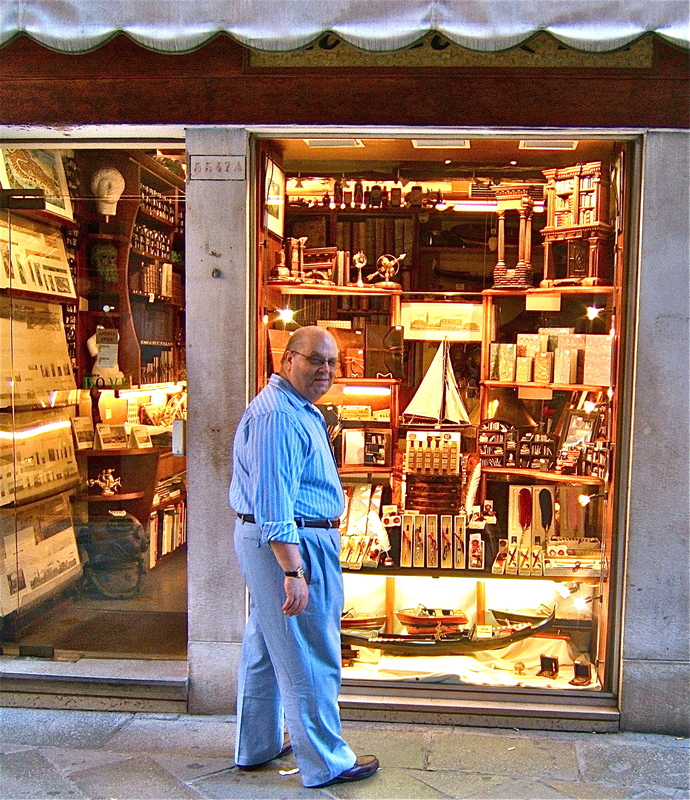 Many touristy stores line the streets, but in general I’d say the shops are eclectic and charming. They sell gelato on every corner so we sampled the pistachio. Hello again, our second day in Venice. Well, we managed to exhaust ourselves yet again. The plan was to go on a walking tour around St. Mark’s Square. We readied ourselves with water bottles, hats, walking sticks and headed out into the hottest part of the day. By the time we were into the second hour, we lost even our second wind. Nevertheless, we stuck it out but quickly headed back to the hotel and again crashed. We only had an hour, however, until we had to get back into the boat bus to St. Marks where we were scheduled for a boat ride. Ah, for careful planning. NOT! We just had dinner in one of the sidewalk cafes where I entertained myself taking a picture of a pigeon that made itself at home wandering in and out of the restaurant. Anyway, we’re in for the night as the heat has pretty much sapped everything from us. So despite our continued exhaustion, we’re still having a great time. Learning to use the local boat transportation system is definitely cool. Our hotel is the location for the gondola ferry, in which two gondoliers take you to the other side of the canal for just 50 cents. So we can say we’ve had a gondola ride and avoided the $100 charge for a typical excursion. I continued to be amazed by the many small shops that dot the allies. Haven’t had any time to do shopping and most places are a bit pricey. Clothing stores carry edgy outfits with definite European styling and flair. Tomorrow we have nothing planned so we’re just going to putter around the back streets looking for gelato. With all this walking, we can put away one of those a day without worry. Bogiorno! I can actually speak one word of Italian now . . . that’s progress. So, Jean wrote, “Whatever you buy, buy me one, too.” So do you want an umbrella with a depiction of Venice? Just askin’. Speaking of buying, if anyone wants a beautiful mask, now is the time to ask. Every other store sells paper mache masks of all kinds and varieties. I’m just not sure what to do with one as I have all the masks I’ll ever need. In my ever quest for souvenirs, I totally resisted the tee-shirt with the plate of spaghetti and the anatomically correct boxer shorts. Regarding the food, we’ve had nice breakfasts at the hotel although Richard was right, Italians don’t know how to cook eggs. The buffet included chocolate cake, but a different kind of flavoring, an orange liquor perhaps. Our favorite drink, “shaken ice tea,” is served in a tall cone glass. The tea has a fruit flavor of choice and froth at the top. We haven’t been to any expensive restaurants yet as we’re grabbing drinks and goodies as we go so appetite for a big dinner. What surprised me most about Venice is the number of dog owners for there is not a grassy knoll to be had anywhere on the island. I did notice that store owners spent considerable time cleaning the storefronts and sidewalks in the early morning. The Dog Whisper would have no customers here; the dogs walk unleashed following diligently behind their owners. The city is surprisingly clean despite the 23 million tourists. Today we wandered the back allies taking lots of photos­–149 so far today and it’s only 3PM. 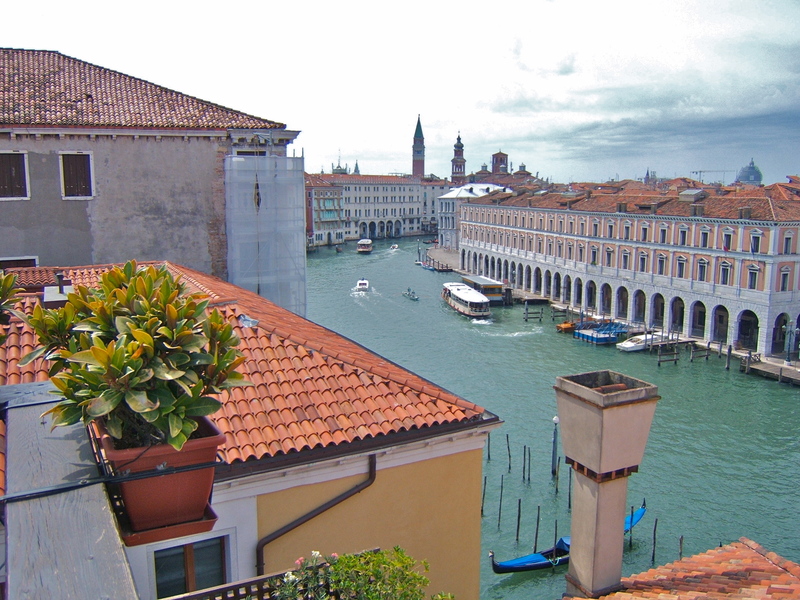 Our hotel has a deck on the roof offering panoramic pictures of the city from the terra-cotta rooftops. During our last night in Venice we meandered through a different part of town toward the other side of the island. All day the weather was changeable with intermittent thunder showers. Naturally, we got caught without the Venice umbrella but ducked into a small tavern. We even had to move inside as hail the size of marbles pelted the canvas covering. Didn’t last long, of course, so after a quick something to eat, we got slightly lost trying to find our way back. Ended the evening sitting on the rooftop accompanied by the house pigeon. Tomorrow we’re off to Florence by commuter boat and train. 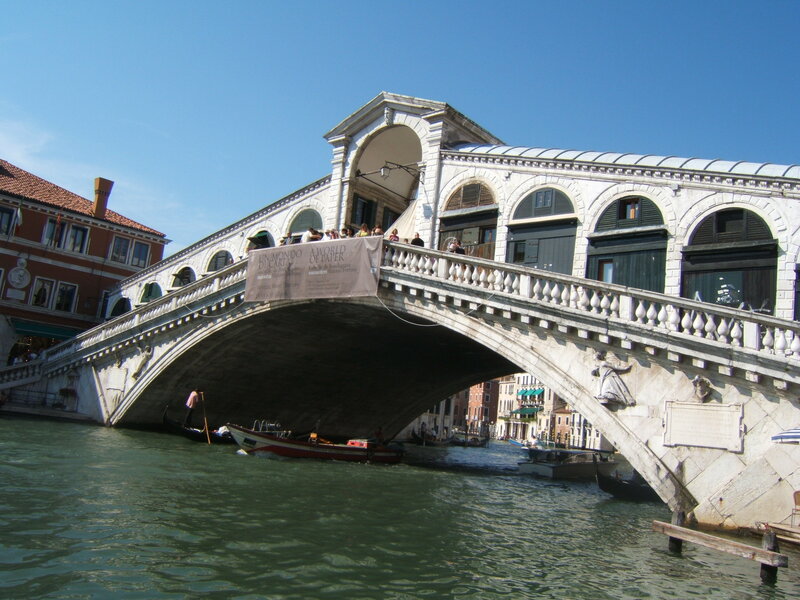 Venice was different from other European cities because almost the entire city was built in the 14th, 15th and 16th Centuries, void of modern architecture. The architecture varied from the Byzantine, Renaissance or neoclassical. Renovations were taking place through the city. Sometimes pictures of facades were impregnated into screens which hung in front of the construction. I couldn’t see any evidence of the city sinking, but one guide told us the water level was once six feet below the current height. After a bit of confusion at the electronic ticket machine, we were finally able to purchase our tickets even if somehow we managed an extra ride to a neighboring station. 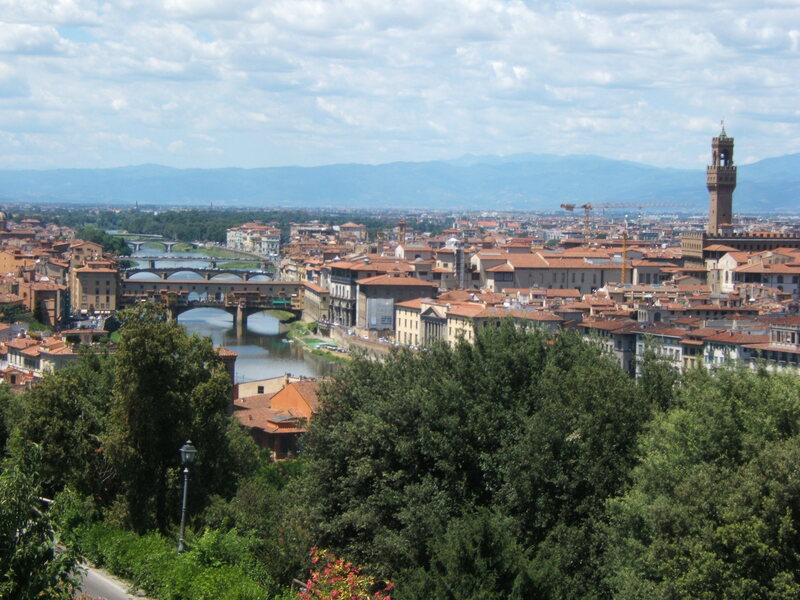 Florence is a beautiful city, much larger than Venice; the noise of the traffic seemed extremely loud, however. I think that was because the water in Venice absorbs sound. Didn’t appreciate the quiet until now. Last evening we took the open-air bus around Florence and surrounds. The scenery from the hills looking down toward the city was beautiful. Cedar and olive groves, clay-colored roofs peaking from the greenery and rolling hills made this area the quintesential Tuscany postcard. The shops here in the downtown area are peppered with the famous names in fashion . . . Gucci, Versace, etc., with prices to match. In one window a purse was selling for 885 Euroes! Looking into the store, three dresses were hanging on a rack. I guess they bring clothes from the back. The popular color is purple, usually as an accent. Most of the dresses and coats in the windows are black. This morning we toured the Uffizi Gallery. The guide told us stories of the famous paintings especially related the metaphorical significance of the symbols and icons. Jean, with all that trouble we have drawing human proportions correctly, you’ll be comforted to know that Leonardo da Vinci painted the forearm of several women too long. Let’s claim any greatness to that similarity of disproportion that we can! 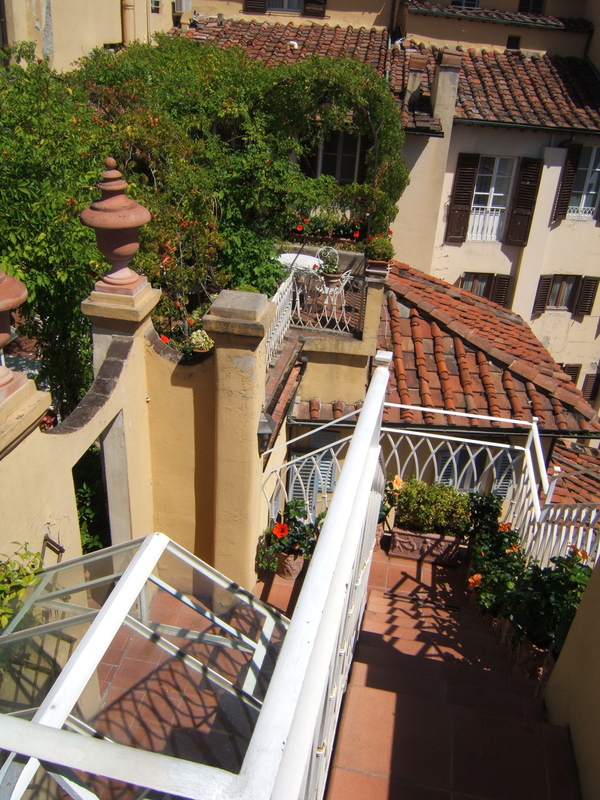 We are staying at the Tournabuoni Hotel, which we had some difficulty finding because the hotel, rather than being at ground level, is on the fourth floor. 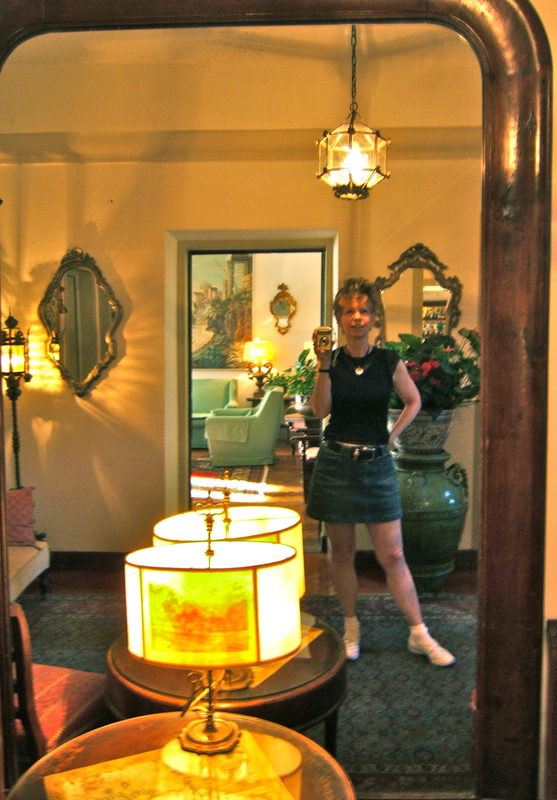 Antiques, tapestries, statues and paintings decorate the hallways. One corridor opened into a rooftop garden. Vines arched over white tables flanked by urns of cascading flowers. Steps to another, yet higher plaza, brought us to sweeping view of the city. We are venturing out on the open-air bus again to see David. Only right that we should also report on a protest we came across on our bus ride to the other side of Florence. Seems that Florence administration is considering the construction of a temporary detention center for immigrants. The protesters decided to pen themselves in at the popular tourist destination. 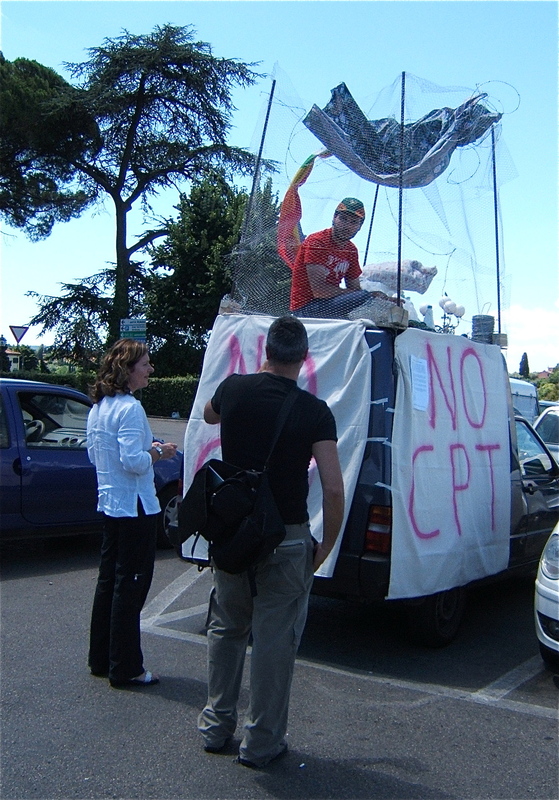 John, thanks for sending the photos of the sweatshop protest. They were great! If you want the text of the Florence protest for Indy Media, let me know. Eight turns and eight set of steps, some of them circular and varying elevations take us from our hotel lobby to our room. We’ve arrived in Spoleto late this afternoon, hugely miscalculating the distance from the train station to the hotel. We got off at the wrong bus stop and had to hike up a cobblestone hill with our suitcases. We made it by stopping every few minutes to recuperate. Already love this town. The ancient stone walls and buildings are characterized by arches and winding steps. Flanked by flowers and pottery, massive wooden doors are imbedded in archways crowned with glass and ironwork. This morning we went on a three-hour walking tour around Spoleto hiking up to the aqueduct traversing the mountain gorge. Sat in the pope’s chair carved in the rock where he was supposed to have meditated looking though the arches of the aqueduct to a 12th Century church nestled in the trees beyond. A three-hour tour, however, in the sun is a bit overambitious for us. I believe we are not acclimatized to the heat as we both get exhausted fairly quickly especially going up hill. In the evening the trip sponsors held a reception followed by a five-course meal. Three different wines were served along with the meal and every dish was exquisitely prepared. For us vegetarians they did not skimp. Starting at 6:30, we did not finish our dinner until 11:30. I have to admit, however, for me that was a bit long to sit and chat. I guess I’m an “eat and run” American. Richard was off to his rehearsal this morning so this was my time to explore. So where did I head? Out of the old town, where prices in the stores were still sky-high, and into the new part of the city. First bus stop left me off at the market where the locals shop. Tent after tent of all kind of goods lined the street. Nirvana! Wish that I needed a new purse and shoes cause there were plenty of good selections to choose from. Bought a few things then headed back. So I managed to get around town without getting too lost. So where did I have trouble? In that dark hallway in our hotel where I missed one step and tumbled down. Luckily, I came out of it with just a twisted ankle that doesn’t seem to be too painful. I’ve taken many pictures of the doors in this town. Most are massive with varied carvings. 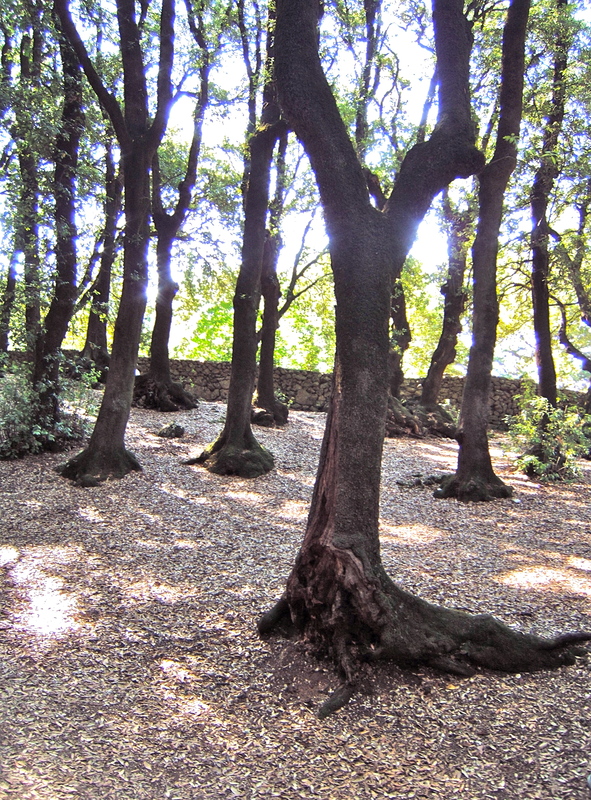 The surrounding walls of stone contrast with the character of the dark wood. Iron work crowns most doors. While walking the narrow allies, we would duck into the door wells as cars passed within inches, although I noticed that Italians just keep walking. The shops and restaurants decorate their exteriors with flowers, signs, potters and other miscellaneous items, which means stopping for yet another picture. This is a city of walls, some dating back to the Roman Empire. Previous civilizations spent a great deal of time and energy on wall construction although the guide at the castle said that the fortress was mostly built to show the power of the Italian Church as there had been a long sequence of French popes. At noon we departed on our mini-buses for on a twisty road up to a farm at the top of a mountain to enjoy freshly prepared lunch. From there we left for Monteluco Mountain to follow in the footsteps of St. Francis. The name of the mountain, derived from the Latin lucas, which means a wood sacred to Jupiter. 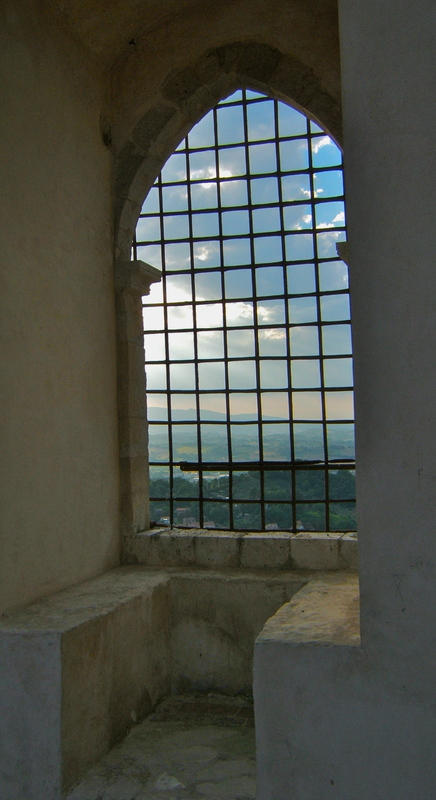 Perhaps the sacred mythology drew St. Francis to the area in 1218. We entered into the forest through a wooden arch. A quiet place, the woods seemed like a refuge as the silhouettes of the dark trees stood against the bright sunlight like guardian sentinels. Upon finding the right spot, the Umbrian Serenades chorus began the chant of Helleluyanm, a traditional Muskeego (Creek) melody. I caught the early morning train to Rome on my way to Salerno. I’m traveling by myself as Richard had choral rehearsals the next three days. I had to muster courage for this adventure as I cannot speak Italian, and I would be traveling into unfamiliar places. I researched extensively and studied maps and guidebooks to feel confident to take on this journey. The Euro-Star sped along the countryside, past fields of grapes, corn and sunflowers and flocks of sheep. Eventually the mountains broke to the sea. Judging by the number of suitcases in the overhead compartments, I guessed that most passengers were vacationers. I didn’t observe any other Americans on the train. The conductor never came by to collect my ticket, which is kind of funny since there are so many regulations about ticket stamping. Cannons firing, bands playing, bells ringing, fireworks lighting the night sky all of which I am experiencing from the terrace of the bed and breakfast at which I am staying. The warm Mediterranean breezes drift through the arbor above, rustling the stiff leaves against each other mimicking the sound of gentle rain. 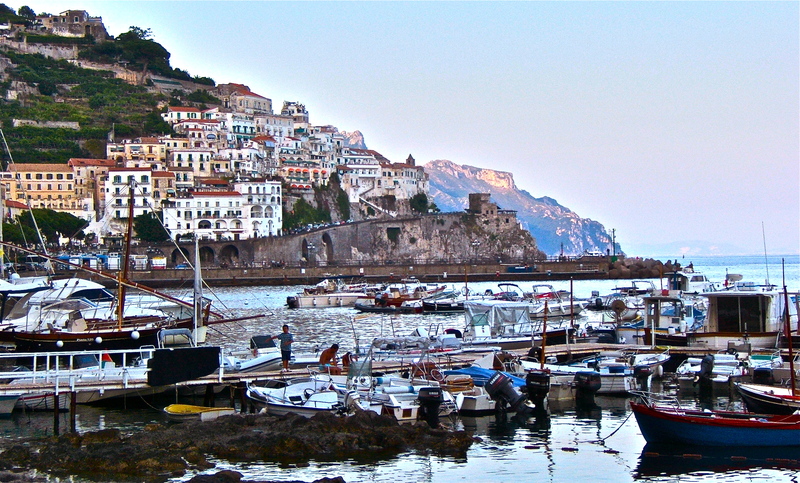 A surprise to experience all of this in a single evening–not really, I’m at Amalfi. This adventure began after getting off the train in Salerno, the southernmost city on the coast. 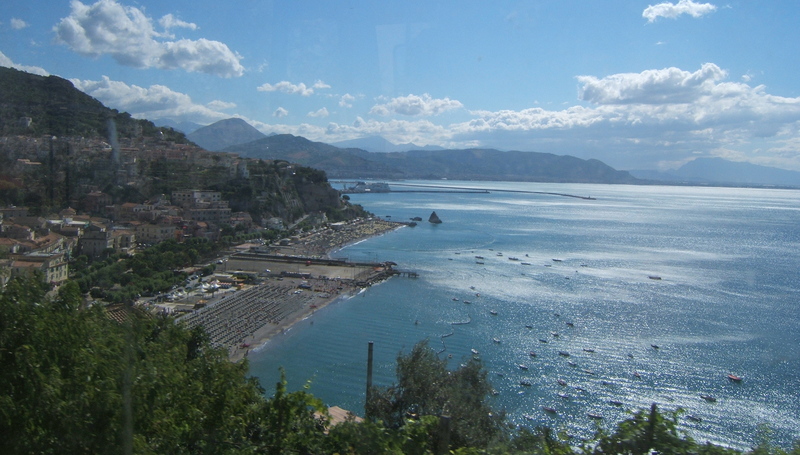 I boarded the Sita bus, the public transportation for the coastal communities, and for only three Euros I could ride to Amalfi. After leaving the city proper, the dramatic coastline came into view, but it was the bus ride itself that occupied my attention against that backdrop. The bus began a series of hairpin turns the likes of which I have never experienced, and putting any Disney ride to shame. Every 30 seconds or so the driver would honk his funky oogah horn to warn oncoming traffic that the bus was swinging around the turn. The bus sat high so the view of the turn brought passengers right in front of the low wall, the only protection from the cliffs below. Sometimes the driver would swing so far out, I thought he would take the wall with him. In actuality the driver was very skillful even when rounding the corner and facing oncoming traffic only inches away. However, I found myself asking the question was there more chance of the bus falling into the cliff or off of it? The cliff road was narrow. In order to let traffic pass the bus would have to glide backward, and I was sure we’d plummet into the sea. Sometimes the cars would be forced to back up for the bus, and in one case a shiny little car began the backup process only to have his fender crunched on the rocks. The bus began to feel warm; it seemed the air-conditioning was not working. I just hoped that lack of oversight did not extend to the breaks. The bus became crowded as more riders came on board. People standing shoulder to shoulder in the aisles seemed to throw off the equilibrium of the bus as they shuffled to hold their balance. The excitement of the ride extended to the views of mountains against the blue sea and the walled embankments. In defiance of gravity houses and hotels hung on the cliffs. The breaks in the turns occurred when we drove through the plazas of the towns along the way. We entered into Amalfi. My next objective was to find another bus going to Ravello, located high on the nearby cliff. The bus pulled itself up the steep road, and again the hairpin turns occurred with regularity. At this point I was getting tired and a bit woozier being up from six in the morning, now approaching four in the afternoon. When I got off the bus, I looked for my lodging inquiring at the nearest restaurant. The waitress was kind enough to put in a call for me. 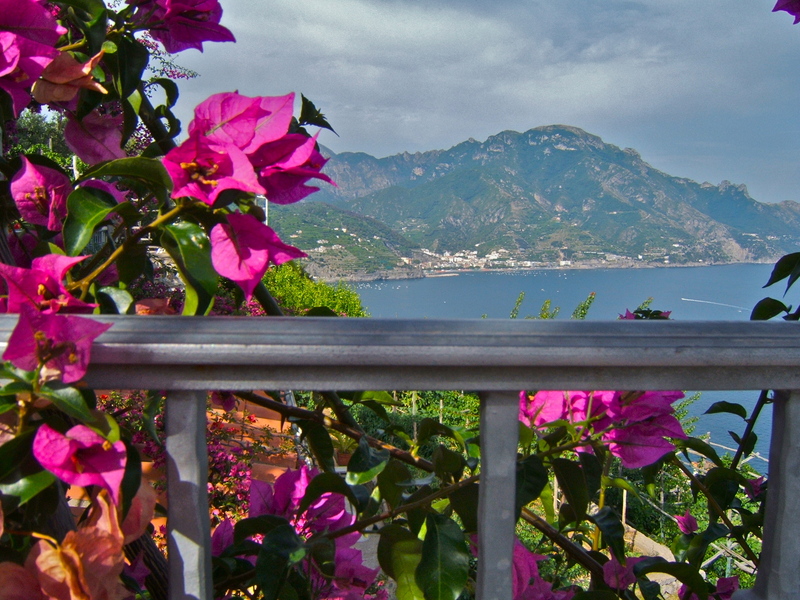 Turns out I totally missed the stop as my B&B was at the bottom of the hill at Ravello. Unfortunately, the bus did not return for almost two hours. I eventually was back on the bus again facing the hairpin turns going down to my stop, but I finally made it! Standing on the terrace of my B&B looking out on the Mediterranean Sea, I wished that everyone could have been there with me. 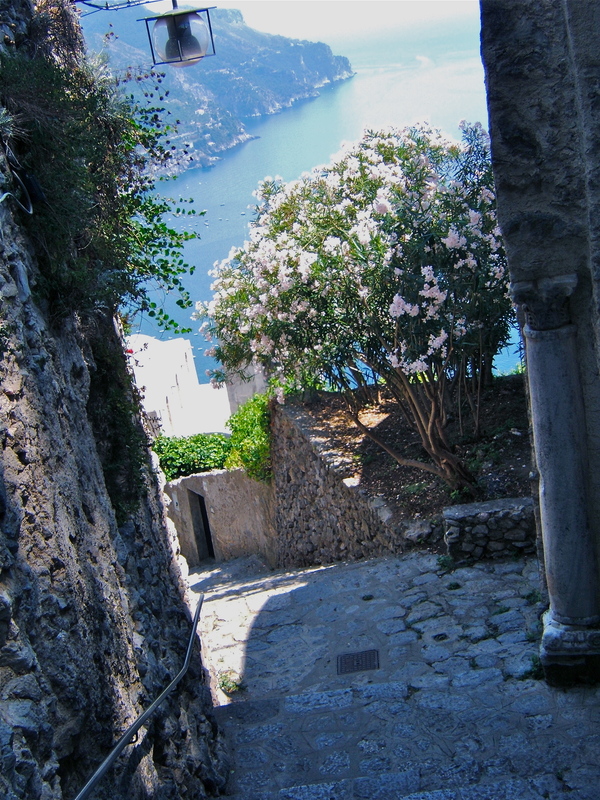 After resting for several hours, I decided to head out for something to eat in Amalfi taking the long and arduous stairways down the cliff. 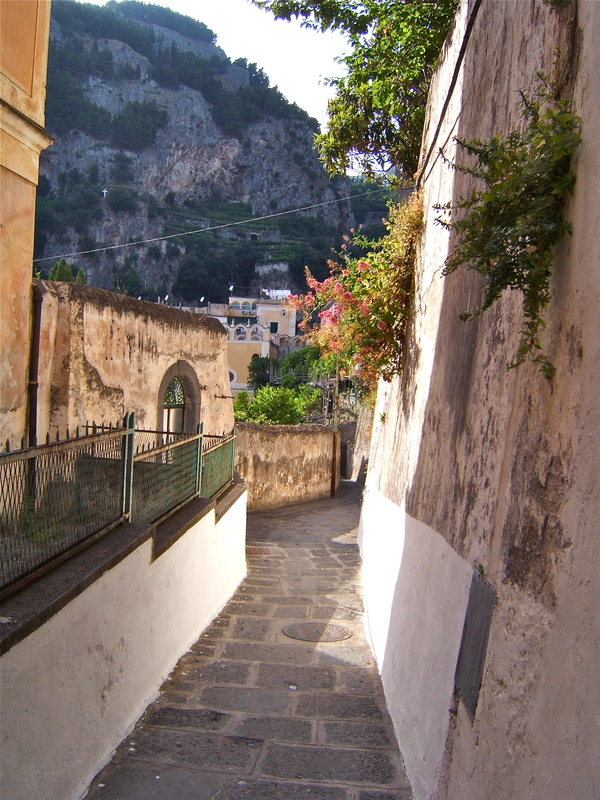 The surrounds changed from scrub brush and rock as I came into the town of Atrani. Following the concrete path into the back allies, the way soon became a maze. Buildings flanked the narrow path, choices of which way to turn became confusing. I had no way of knowing which way was out; the guidebooks warned that the paths are seldom used by locals so there was no one to ask directions. I continued on until I noticed steams of people in the corridor in front of me, and I finally came into the main plaza of Atrani. The main road and sea were just off the plaza. I followed the road, only to become faced with a dilemma: whether to walk the 200 yards through the traffic tunnel of death with no side path for pedestrians while those Sita buses and other vehicles would be whizzing through; or take the other option of walking the steps up and over the tunnel and facing the maze of buildings again. I opted for the steps. Sure enough I became lost again in the maze of passageways, at one point having to make a choice among four different staircases. I felt like Dorothy on the yellow brick road. Eventually, I could hear the sounds of the town and found my way out heading in that direction. Little souvenir shops flanked the plaza at Amalfi, and at the water’s edge umbrellas and beach chairs covered the dark sand. Tables and chairs spilled out of the restaurants and cafes along the shore. The beach hubbub was in full swing as people moved between the shore and shops and as traffic ribboned its way through the crowds. Didn’t notice any traffic signals or stop signs. It was chaos but seemed to work. I stopped at one of the cafes for pizza, which is always excellent, and headed back to the bed and breakfast, taking the bus this time. I just wanted to let you know that your distant cousins in Italy appear to be doing well. Not seeing any meows in Venice or Florence, we were not disappointed in Spoleto where a small colony of ferrels occupied a spaced outside the castle walls. Noticed someone left a bowl of water. However, fountains provided refreshments at any time. On a farm not far from the town, we came across a very pretty kitty. I got my “kitty fix” as the little one was quite obliging about letting me give snuggles while also taking a movie. 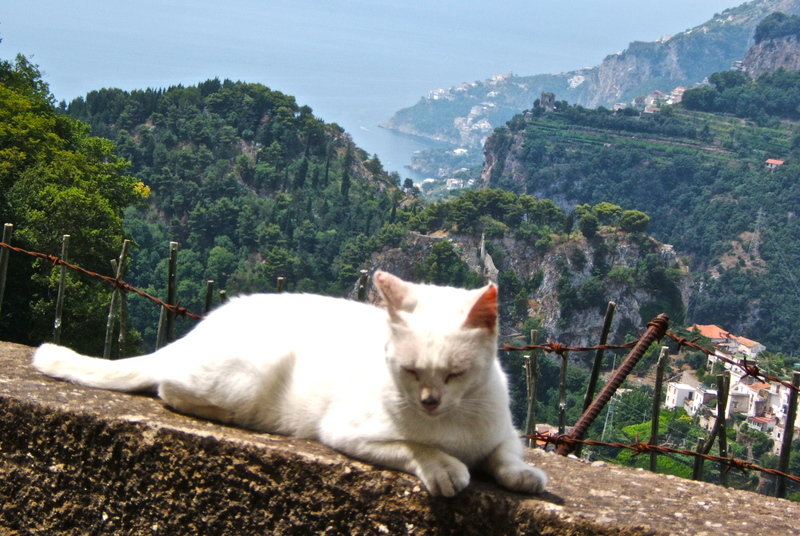 A majestic white cat allowed me some photos while I was at the Amalfi Coast. Miss all the meows very much; understand that you have not been neglected in any way. Many thanks to the meow caretakers of all shapes and varieties. Love and squeezies to all. I changed direction and headed down a path with spectacular gardens and views. In the distance I could see the town of Minori far below where the boats looked like little dots in the water. I continued down the steps then stopped. I had to decide: walk back up or continue on. If I continued to walk on, the commitment would be made as no bus lines run across the path; but walking back up the hill in the heat seemed even more strenuous. I decided to continue on–walking past churches, olive trees, grape arbors until I arrived in Minori after descending on steps for two hours. The sea provided cooling relief to my feet, and I lingered on the pier before catching the bus. Back on the terrace of my B&B, the evening closed with the band playing “Stars and Stripes Forever” followed by fireworks discharged from a boat right below our balcony. The fireworks lit the night sky with color reflecting on the water. At midnight bells began ringing across the valley. Arrived safely back from Amalfi; experienced some confusion at the train station at Rome: getting on the wrong train then running to catch the right one with only minutes to spare. We started the pilgrimage to Assisi early in the morning, which was to be a full day lasting until midnight. Just coming back from Amalfi the night before, I wasn’t sure whether I had the energy to sustain another long travel day. As it turned out, everything went well. We toured the town and cathedral, our guide focusing on the Francis guy, bless his heart for trying to bring the church to awareness of the poor and downtrodden. However, Johnny would say that by appealing to the poor, removed their incentive to rebel against authority systems. 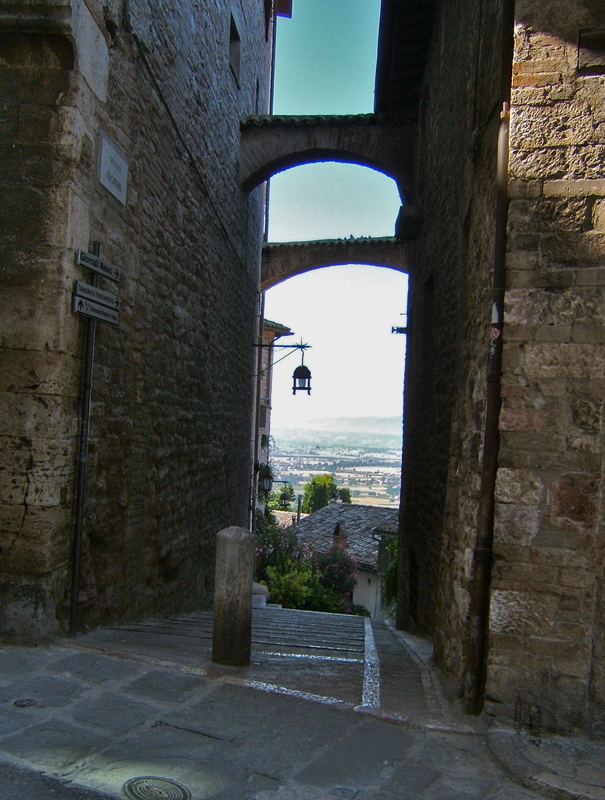 Assisi is a medieval town with high walls and flying buttresses. The countryside stretched out before us from the church plaza. Our tour included a stop at the library, where a friar presented us with important ancient documents for the 13th century and the founding of the Church. Despite the large collection, an assortment of scoundrels including Napoleon absconded with many books and documents. The problem of conquering countries helping themselves to Italy’s art treasures was a theme we heard through our travels. What’s hard to understand is why these countries still believe they have the right to keep these objects now. 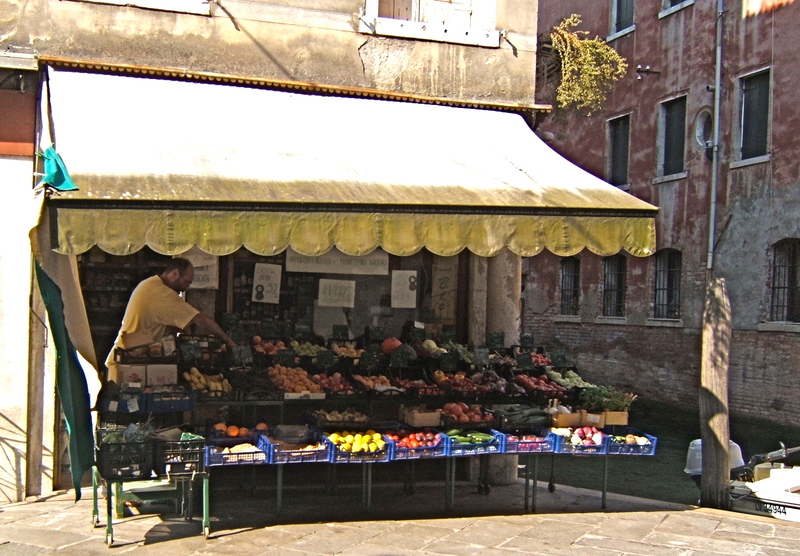 In the afternoon, we walked the streets stopping in the many small shops along the walled corridors. Schlocky souvenirs, included thousands of little Francis figurines (I’m sure he would not pleased) were everywhere but somehow because the storefronts were quant and tastefully decorated, the experience seemed to pass muster. The Umbrian Serenades performed in the main basilica. The sound was incredible, the first of which was Richard’s resonant voice leading the chant as the choir entered. When they finished the last note of each piece, the sound reverberated in such a way that the cathedral sang back. I thought how wonderful that both MaeC, who toured Italy with her high school choral group, and Richard sang in this place. We ended the night with a multi-course dinner at 16th century former monastery. They toasted the bread in an outdoor wood fire and served with bruschetta with zucchini puffs. The meal lasted until late in the evening, which for me is exhausting. I certainly have learned to appreciate taking time to eat and enjoy each course, but overall, I believe they could knock an hour or so off without any damage to the experience. Tomorrow we are off to Sienna and then to Rome for two days and home. Hope all is well at home. Looking forward to seeing you when we return. Arana, glad you like the site . . . it’s been fun to put together. I would like to do a family history tab at some point. That would be a huge project! I have so many family photographs to sort through. Yes, that is me petting the kitty, trying to hold the camera steady while focusing on the little one. Video taken on a farm near Spoleto, Italy. Now that I have cats of my own, the kitties have created focal points that were totally unintentional! I was warned, however, when I saw my sister’s family lives revolve around their three cats.